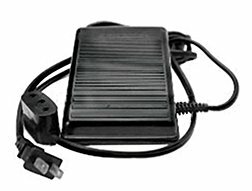 This replacement foot controller is much more comfortable and offers better speed control than the Singer button type controller. Works on all Singers with the standard 3-pronged plug. Comes complete with wires installed. Note: If you would like this controller supplied with the deluxe cord set we will be glad to make that up for you. Also if you need it with the 2-prong plug for the Singer 301, or the plug for the 500/503 series we can do that too. Just contact us by email and we will get you what you want.